Mezcla, under the direction of Pablo Menéndez, has been a part of the sound-track of the Cuban music scene for the past twenty-five years. A jazz ensemble fusing Afro-Cuban rhythms with yoruba and rock, Mezcla's music is a genuine celebration of the culture and musical roots of the Pearl of the Antilles. Mezcla was founded in 1985 by guitarist Pablo Menéndez, who as the son of Barbara Dane was born in Oakland, California but has lived in Cuba since 1966. Pablo's earlier history is interesting in itself; he was a cofounder (in 1970) of the seminal Grupo de Experimentación Sonora del ICAIC, and his resume also includes work with Sonido Contemporaneo and Síntesis among other groups. Under Pablo's leadership, Mezcla helped open the doors for many other bands by becoming the first modern music group in Cuba to tour the United States in the mid-1990s after protests against the travel ban that included support from United States guitarist Carlos Santana. True to its name, the band has incorporated a broad spectrum of styles in its material from folkloric Afro-Cuban all the way to Reggae, Rock and Fusion throughout its career. Pablo has also served as a key link between musicians in Cuba and the United States for many years. Mezcla is a ray of Havana sunshine that inspired Carlos Santana to call them “the cleanest, freshest water I have ever tasted!" Mezcla has frequently incorporated social commentary into its lyrics in addition to the usual and customary songs about love etc. At different points in time, elements of Jazz have also been incorporated in the repertoire. 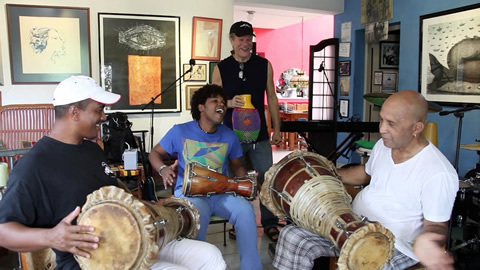 The 2013 version of Mezcla places a stronger emphasis on folkloric and Jazz elements, and this is reflected in the powerful combination of master drummers that are now in the group. Their CD, “I'll See You in C-U-B-A,” (ZOHO), was nominated for the Best of Latin Jazz Awards 2010 as were several of the group's soloists. A multi-generational ensemble, Mezcla brings together several veteran masters with some the best of young jazz players on the scene today. 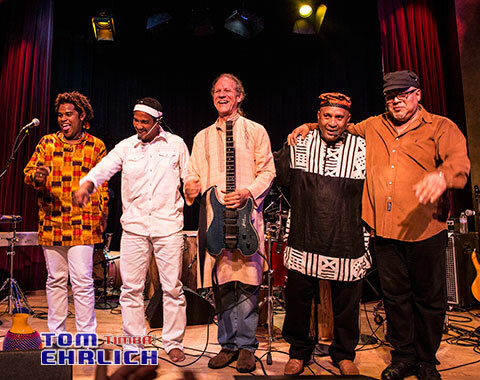 Mezcla's 2014 U.S. Tour featured an all-star ensemble led by guitarist Pablo “Mezcla” Menéndez includes Afro Cuban babalao priest and conga/batá drum master, Octavio Rodríguez; celebrated super-percussionist Roberto Smith "El Capitán"; veteran bass-monster José Hermida and multi-instrumental wizard Julio Valdés Fuentes.